Prep time: 20 minutes for the crust plus one hour to chill the dough, and 20 minutes to prepare the filling and finish the piecrust for baking. Combine flour, sugar, salt, water, and shortening in the bowl of an electric mixer fitted with a paddle attachment. Mix on low speed until ingredients are well combined and dough is smooth. Press each piece out to form a 6-inch disk and wrap them in plastic wrap. Refrigerate the dough for at least one hour or for up to 1 week. 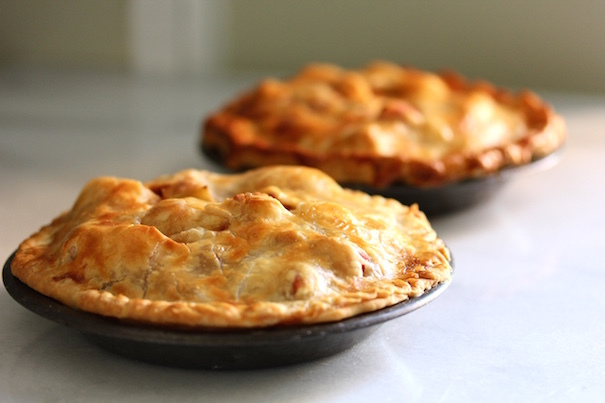 Pie dough may be frozen, wrapped in plastic, and then in aluminum foil for up to 3 months. Mix together fruit and add sugar and cinnamon in a mixing bowl. Gently add flour in, a little at a time, to thicken filling. Roll out pie crust dough and place in bottom of pie pan. Pour filling into crust and mound at the center. Roll out the second piecrust, and using a small cookie cutter, cut out several decorative holes for steam to escape. Put the top crust on the pie and crimp edges to seal crust. Whisk egg together and brush crust with egg wash.
Bake at 425 degrees for 40 minutes, or until crust is golden brown. Cover edges of pie with aluminum foil to prevent crust from burning. Remove from oven and remove foil. Allow to cool several minutes before cutting.